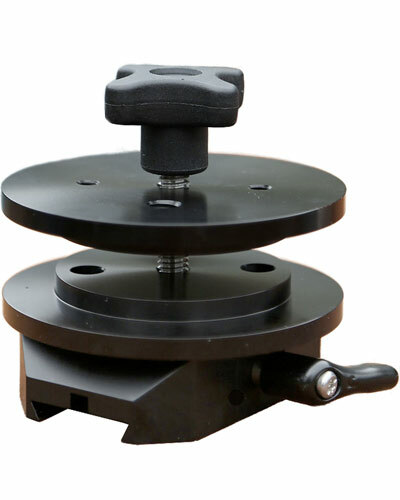 The Dove Block Universal Mount is designed for adapting the DJI Ronin Gimbal to speciality camera systems like cranes, steadicams, & tripods. The dove block kit comprises of a Dove Block, 2 Mitchell/bowl mounts and a set of bolts. With this kit you can attach the bowl plate to virtually anything. The Dove Block is designed to receive the DJI Ronin quick release mount. On the back it has a number of holes to allow it to be mounted to accessories including tripod plates, cheese plates and the supplied accessories. Combined with the Mitchell/bowl mount, the Dove Block can be mounted onto Jib arms, allowing you to fly a Ronin on the jib, and control the camera from a distance.